The electric Mitsubishi electric i MIEV continues to evolve and this year it is no different at the New York Auto Show. The i MIEV has made some changes since our last visit with the concept. Now MIEV means Mitsubishi Innovative Electric Vehicle, rather than Mitsubishi In-Wheel Electric Vehicle. This concept has a 16 kW lithium-ion battery with a 100-mile range that recharges overnight from a standard home outlet or dryer-style outlet. A 63 HP motor churns the vehicle along. There is also two models now available, the regular i MiEV and now a super fantastic Sports coupe model. The Sports coupe is even greener by including solar panels, wind turbine fans, reduced CO2 emissions and solar control glass that can monitor the amount of light and heat entering the vehicle and adjust the in-car air conditioning accordingly. The Mitsubishi Motors vehicles displayed at the 2008 New York International Auto Show will help North American consumers "get small" and get acquainted with Mitsubishi's renowned small car building capabilities. Tetsuro Aikawa, Managing Director In Charge of Product Development Group Headquarters, will introduce to the North American media the i, i MiEV, i MiEV Sport concept and Concept-cX minicars. The concept and production cars will raise awareness of the capability, sophistication, and design intelligence found in the Mitsubishi's minicar and compact vehicles. Beyond the obvious advantages offered by smaller, lighter weight vehicles such as improved fuel economy, maneuverability, and reduced cost of ownership, the Mitsubishi models on display offer clever design features and capabilities traditionally associated with larger cars. The increased congestion of urban environments, rising fuel prices, and the cumulative effects of exhaust emissions are all compelling arguments for smaller, more efficient personal transportation. The innovative design and layout of the award-winning "i" minicar showcases Mitsubishi's small car building prowess. Three "i" variants will appear at the Jacob K. Javits Convention Center, including the "i" (gasoline), the i MiEV (Mitsubishi Innovative Electric Vehicle), and the i MiEV Sport concept. The Mitsubishi Motors "i" family represents technological progress in capability and efficiency of the small car concept. On sale in Japan since 2006, the innovative "i" minicar maximizes a kei-class* car footprint to combine a smoother ride; nimble handling, interior space to accommodate four adults, all wrapped in a unique, stylish package. The "i" is powered by an aluminum three-cylinder, 660cc turbocharged, gasoline engine. This premium minicar's unique rear midship layout locates the engine ahead of the rear axle and helps the vehicle overcome the challenges for interior space, ride comfort and handling typically associated with the minicar class. The optimized interior package long (2550mm or 100.4 inches) wheelbase yields class-leading comfort, handling, and ride quality. The exterior and interior designs offer a fresh take on the traditionally boxy minicar class. The "i" proved so successful at conquering the challenges associated with small car design that it won several major awards including the RJC (Automotive Researchers and Journalist Conference) Car of the Year 2007, and the Good Design Grand Prize 2006 (awarded by the Japan Industrial Design Promotion Organization). While the RJC award focuses on the automotive industry, the Good Design Grand Prize has a 52-year tradition and screens entries from all fields of human activity based the view that design is an essential element in all fields of everyday life and industry. The "Good Design Award 2006" received 2,918 entries from April 26th to June 7th 2006. *The kei-class is a popular small vehicle segment in Japan that is limited to a 660cc engine and a 3375mm (132.9 inches) long x 1475mm (58 inches) wide footprint. Vehicle taxation in Japan is related to elements such as engine displacement, vehicle size, and emissions; minicars offer owners tax advantages and reduced cost of ownership. The i MiEV electric vehicle, in its first US show appearance, improves on the efficient rear mid-ship layout by adapting a zero-emissions state-of-the-art electric drivetrain to this small car package. A durable 330-volt lithium-ion battery system is located under the floor deck, powering a permanent magnet electric motor. With this packaging, the i MiEV is able to offer the same level of interior utility and space as the gasoline version while lowering the center of gravity for more stable handling. The 47 kW electric motor offers improved performance over the 64 hp gasoline version. With instantaneous electric power, the i MiEV offers quicker acceleration compared to the gasoline version. The battery, developed by the MMC joint venture company Lithium Energy Japan, represents the leading edge in battery technology, and promises up to 100 miles of driving on a single charge. 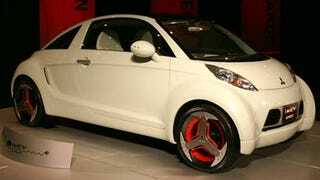 The i MiEV will launch in Japan next year (2009), adding a no-pollution solution for congested city streets. The i MiEV Sport concept, making its North American debut in New York, maximizes the sporty possibilities of the zero-emissions electric vehicle. The i MiEV Sport concept is a coupe variation on the i MiEV with a "fastback" roofline with a strong performance bias, leveraging the electric vehicle's natural advantages for a performance payoff. The Sport is constructed using a rigid lightweight aluminum frame that helps improve performance and range. The rear mid-ship layout (like the i MiEV) optimizes interior space and ideally situates the drivetrain's electrical components to maximize handling. In the interest of improved on-road capability, the i MiEV Sport's powertrain utilizes multiple electric motors. Two 20 kW electric motors, one built into each front wheel, work together with a single, powerful 47 kW motor that drives the rear wheels. Power output, traction and braking at all four wheels are controlled by the S-AWC (Super All-Wheel Control) system which integrates the ABS and ASC (Active Stability Control) systems to provide outstanding control and handling. For this electric vehicle application, a new E-AYC (Electronic Active Yaw Control) produces the same torque vectoring characteristics as the Lancer Evolution's AYC to give the vehicle playful road manners while maximizing stability and control. The advanced, futuristic i MiEV Sport concept is also environmentally thoughtful in function and design. While a light green pearlescent exterior evokes thoughts of nature, the heat-absorbing window glass improves the efficiency of the air conditioning and low-drain LEDs are used throughout the vehicle including the rear combination lamps and interior lighting. An auxiliary photovoltaic generator on the roof makes effective use of solar energy; turbines in the front grille harness wind power; regenerative brakes capture motive power. The interior styling is clean, simple and fluid, allowing the driver to feel at home in this sporty, zero-emissions electric vehicle. In addition the trio of "i" minicars, the Concept-cX will appear at the New York International Auto show.The Concept-cX showcases a forward-thinking small SUV design that offers high levels of road and environmental performance with a newly developed 1.8-liter clean diesel engine mated to a Twin Clutch SST (Sport Shift Transmission). With its high seat position providing a wider field of view and its split tailgate giving easy access to the luggage compartment, the Concept-cX offers enhanced safety, utility and convenience. The interior is a nod to the modern with a mix of black and white with warm brown leather accents. A clean, sophisticated IP allows the driver enjoyment in an appealing, comfortable environment. Energy-absorbing materials are used throughout the vehicle, including the lower bumper, to increase the ability to restore its form after minor collisions. The Mitsubishi Concept-cX is a small soft-roader for on-road use that combines a high level or utility, fuel economy and driver enjoyment. Also on display will be Mitsubishi's latest additions to the compact Lancer series, the high performance Lancer Evolution, the 2009 Lancer GTS 2.4 and the turbocharged Lancer Ralliart, showing how much fun can be squeezed into a smaller sedan. Building off the success of the redesigned 2008 Lancer, the 2009 Lancer GTS boasts a new 2.4L engine and combines a sport-tuned suspension with 18-inch wheels, 215/45 R18 tires and large 4-wheel disc brakes. Powered by a new 2.0-liter DOHC MIVEC intercooled and turbocharged engine that boosts an estimated 235 horsepower, the Lancer Ralliart offers a medium between the Lancer GTS and the Lancer Evolution. Set to arrive at dealerships in the summer of 2008, the Lancer Ralliart will also feature a Twin Clutch-SST gearbox and a full-time 4WD driveline with Active Center Differential (ACD). Mitsubishi Motors North America, Inc., (MMNA) is responsible for all manufacturing, finance, sales, marketing, research and development operations for Mitsubishi Motors in the United States. MMNA sells coupes, convertibles, sedans, sport utility vehicles, and light trucks through a network of approximately 500 dealers. For more information, contact the Mitsubishi Motors News Bureau at (888) 560-6672 or visit media.mitsubishicars.com.